The second edition of the book is coming soon! 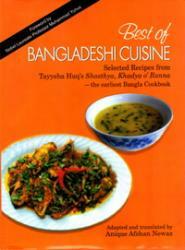 Best of Bangladeshi Cuisine will show even the novice, how to prepare Bangladeshi delicacies. 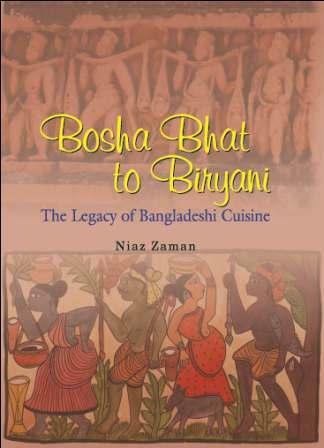 Anique Afshan Newaz has carefully selected more than one hundred and twenty special recipes from the original Bangla cookbook by late Tayyeba Huq. The present book translated and adapted by Anique Afshan Newaz presents hundreds of such recipes derived from the great culinary traditions of the eastern part of the Indian subcontinent. These recipes represent an extraordinary variety of dishes. They include not only traditional Bengali rice, meat and fish preparations, but also a full complement of snacks, appetizers, vegetables and desserts. Delicious beverages which help to balance our diet are also included. The diet range from the spicy, aromatic Kachchi Biryani which made old Dhaka cooking world famous; there are also recipes for the unique but simple country dishes like Patora, Bhapa Pitha and tasty Chapri made from rice flour. Anique has translated the recipes with easy to follow instructions, guiding readers at every step. More importantly, she provides very precise measurements of the ingredients to be used. She also suggests alternative ingredients, easily available in modern supermarkets. These may be readily substituted for the corresponding Bangladeshi ingredients. As further help to the would be cooks, Anique provides a rich and comprehensive glossary of all jargons and those strange terms associated with the culinary art of this region. It is no surprise that Bangladesh has emerged as a nation of restaurateurs, with thousands of eateries spread all over Europe and North America. Their foods excite the palate of millions who love the typical hot South Asian dishes. The book is designed for those who look for the more subtle and diverse flavour of Bengali cuisine, going beyond the conventional Curries and Tandoori Chicken. An extremely user friendly cookbook, both in the hands of the amateur cooks as well as busy professionals, who Would be tempted to try out a variety of menus during the weekend, without the fear of going wrong. They are bound to experiment, showing that cooking the Bangladeshi way can be relatively simple and also can be great fun for the entire family!